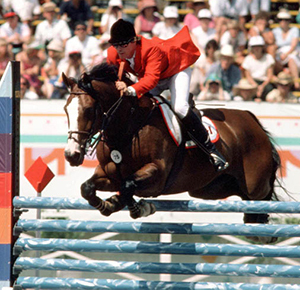 Hugh Graham is one of Canada’s most successful show jumping competitors. His comprehensive resume includes being named to two Olympic teams and three Pan American Games teams, as well as representing Canada on 23 Nations Cup teams, in four World Cup Finals and at the 1990 World Equestrian Games. Hugh began riding at age 12 when, with no previous experience, he broke and trained his family’s newly acquired pony, Thunder. A champion calf roper throughout high school, Graham’s rodeo career ended due to a fractured leg. He went on to work for Olympic gold medallist Jim Day in the 1970’s and became interested in show jumping. He won his first grand prix in 1973 and was named to the Canadian team in 1982. Hard work and determination has brought Hugh enormous success. At the 1984 Olympic, he had the only clear round to solidify Canada’s 4th place finish. At the 1987 Pan America Games, he clinched the gold medal for Canada with a final clear round that defeated the favoured U.S. team. 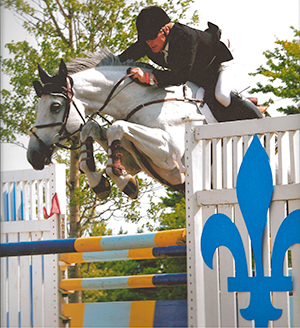 He has been Canadian Show Jumping Champion two times, in addition to numerous championships and victories. Among his distinctions, Hugh was twice named Equestrian of the Year. Other performance highlights include back to back victories with the KingRidge stallion, Money Talks, in the prestigious $100,000 Queen Elizabeth II Cup at Spruce Meadows. Hugh also has an excellent reputation as a trainer of young horses as well as a very effective coach of riders. “I really enjoy seeing a young horse learn and develop,” says Hugh, a testament to his great feel for bringing out the best in young horses. Added to his extensive experience, this makes for the best possible background for the development of KingRidge’s young warmbloods. Hugh has been associated with KingRidge since the late 1980’s and has played a key role not only in competition, but also in the development of their breeding program as well as in the acquisition of their mares and stallions. He spends the winter at the Florida farm where he has the opportunity to train and compete with the young horses as well as to assess the newest foal crops and develop future breeding plans. In 1987, Hugh married Cindy Firestone and they have a daughter, Laurel. Cindy competes very successfully in the hunter ring, and Laurel, who has ridden since she was very young, is beginning her competitive career. Get to know Canada’s charismatic show jumping veteran, Hugh Graham, from his introduction to the sport to his biggest influences. In this interview, the Olympian talks about the experiences, the people and the horses that have helped shape his successful career and what his goals are for the future. Canadian Grand Prix superstar and Olympian, Hugh Graham, reveals & demonstrates his techniques to achieve your tightest, tidiest jump-off turns. No surprise, but basic flatwork and rideability are key ingredients if you want to turn on a dime!